South African surfers posted dazzling performances on opposite sides of International Date Line in the past 24 hours with Bianca Buitendag recording the highest score for a single ride on the opening day of the Target Maui Pro in Hawaii while Dylan Lightfoot progressed to Round 4 of the Hainan Classic in China. After three successive lay-days waiting for waves at the fabled Honolua Bay for the season-ending event on the 2014 ASP Women’s World Championship Tour (WCT), Buitendag took to the surf in Heat 6 of Round 1. Starting slowly, the 21 year-old from George in the Southern Cape rapidly built momentum in the excellent 1 to 1.5 metre surf and belted a near-perfect 9.80 out of 10 points for a series of vertical backhand blasts on her final ride. Buitendag, No. 7 on the ASP Women’s WCT rankings coming into the event, won her heat and advanced directly to Round 3 of the event along with Stephanie Gilmore, Sally Fitzgibbons and Tyler Wright, the three Australians who are in contention for the 2014 ASP Women’s World Title. The Target Maui Pro runs until December 6 and can be followed live via www.aspworldtour.com starting at approximately 7.30 (SA Time) on each day of action. Meanwhile at the same time that Buitendag was shredding the legendary waves of Honolua Bay on Monday afternoon, on the other side of the dateline Lightfoot was demonstrating his ability in tiny waves at Riyue Bay on Hainan Island in China on Tuesday afternoon. Seeded into Round 2 of the 4 Star rated ASP Qualification Series event, the Jeffreys Bay resident squeaked through his first heat, narrowly avoiding the ignominy of being eliminated by 15 year-old Leilani McGonagle (CRI), the only girl in event. Awarded 4.53 points for his last scoring ride, Lightfoot clinched second place just three-hundredths of a point ahead of McGonagle. Lightfoot made better use of the miniscule knee to waist high waves on offer in Round 3, employing both his backhand and forehand attack to secure a solid heat win and moving to within one heat of a Quarterfinal berth. Lightfoot is the last remaining South African in the event and will take on Miguel Tudela (PER) and Australians Harrison Mann and Kai Hing in the next heat when competition resumes. The top two finishers there will advance to the Quarterfinals, where the event format changes from four man heats to man-on-man competition until a winner is crowned..
SA’s Michael February (Kommetjie) was eliminated in Round 3, placing third in the heat before Lightfoot’s, and finished equal 17th overall with earnings of US $1 250 (approx. R13 750) and 237 rankings points. Both David Brand (Kommetjie) and Casey Grant (Scottburgh) were ousted in Round 2. The Hainan Classic runs until 28 November and can be followed live at http://hainaninternationalsurfingfestival.com/hainan-classic/live/ starting at approximately 2am (SA Time) daily. Back in Hawaii, Tuesday also saw the Vans World Cup of Surfing – stage two of the Vans Triple Crown series and the penultimate Prime rated event for 2014 – commence at Sunset Beach on the North Shore of Oahu in stormy 10 to 15 foot (3 to 5 metre) surf. 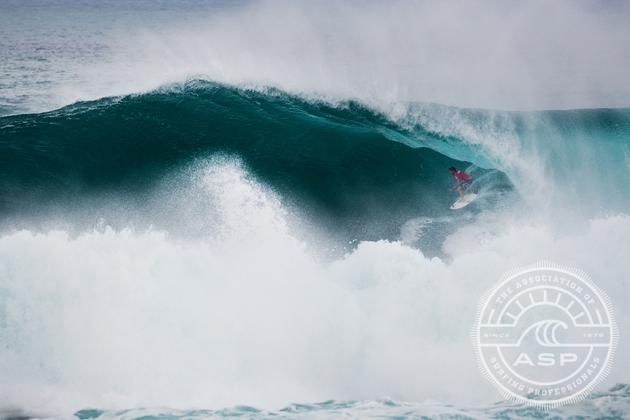 The 16 heats in Round 1 were completed with Hawaiians dominating the results in the difficult conditions. Beyrick de Vries (Umhlanga) will be the first South African to compete in the event when he faces defending champion Ezekiel Lau (HAW), Stu Kennedy (AUS) and Chris Ward (USA) in Heat 4 of Round 2. De Vries famously scored a perfect 10 point ride in the corresponding event at Sunset Beach last year after pulling into and exiting cleanly from what many knowledgeable commentators are calling the biggest tube ride seen in a contest at the venue in nearly 50 years (since the late 1960’s!). ASP World No. 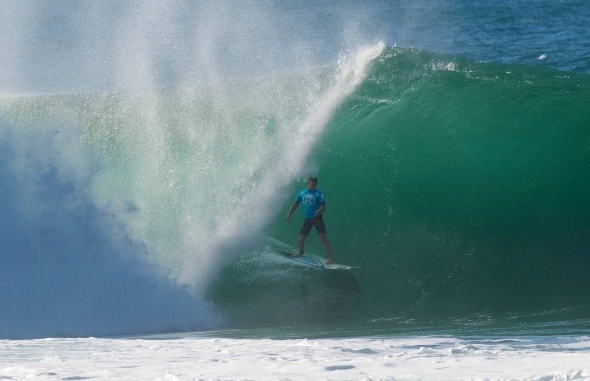 7 Jordy Smith and fellow ASP WCT campaigner Travis Logie are scheduled to start their campaigns in Round 3. Logie will be competing in the event for the last time after announcing his retirement from professional surfing following next month’s Billabong Pipeline Masters. Logie was crowned the ISA World Champion in 2002 and has spent the last 10 years competing at the highest levels of the sport. The Vans World Cup of Surfing has a waiting period that runs until 6 December and can followed live at www.aspworldtour.com starting at approximately 7.30pm (SA Time) on each day of action. South Africa’s Bianca Buitendag employed her trademark vertical backhand manoeuvres to clinch third place in the Hunter Ports Women’s Classic, a 6-Star rated ASP Qualifying Series (QS) event in Newcastle, Australia today (Sunday). Buitendag was in sparkling form, winning three of the four heats she contested on her way to the semi-finals before bowing out to Alessa Quizon (HAW) by 11.83 vs. 14.50. The 20 year-old from George collected US $1 900 (about 21 000) and 2 080 points which moved her up to No. 7 on the ASP Women’s QS rankings after three events. The confidence boosting performance was ideal preparation for Buitendag’s campaign on the 2014 Samsung Galaxy ASP Women’s WCT which gets underway at the Roxy Pro Gold Coast in Queensland on 1 March. In 2013 she finished her inaugural year at the highest level ranked No. 8 and was crowned the Rookie of the Year. The Hunter Ports Women’s Classic was won by Malia Manuel who defeated fellow Hawaiian Alessa Quizon in the final. SA’s Sarah Baum (Durban) finished equal 13th and Faye Zoetmulder ended equal 67th. The Burton Toyota Pro, a 6-Star ASP QS men’s event, which ran in conjunction with the women’s event as part of the 2014 Surfest Newcastle Australia, was won by Matt Banting who beat fellow Australian Nathan Hedge in the final earlier today. Beyrick de Vries (Umhlanga) and David van Zyl (Durban) were the highest placed South Africans in equal 17th place with US $2 000 and 625 points each. Slade Prestwich (Durban) ended equal 49th, Dale Staples (St Francis Bay) and Dylan Lightfoot (Jeffreys Bay) were equal 73rd and Michael February (Kommetjie) placed equal 97th. Lightfoot also reached the quarter-finals of the Hunter Business Boardriders Pro Junior, finishing equal 13th overall. See www.surfest.com for full results, photos, videos and more. Ballito, South Africa, (Saturday July 6, 2013) – Australian Julian Wilson, 24, (Coolum Beach, QLD) has won the ASP Prime Mr Price Pro Ballito, defeating Jordy Smith, 25, (Cape Town, ZAF) in a memorable Final at Willard’s Beach on Saturday July 6, 2013. Stop No. 3 of 8 on the ASP Prime Series culminated with the most anticipated match-up of this year’s competition – event standouts, Smith and Wilson, living up to expectation with inspired performances in front of a capacity crowd. While Smith assumed an early lead to put Wilson in a combination situation (needing a combination of two scores) with his 7.67 and 8.83 (out of ten) scores, it was Wilson’s high-risk approach that was rewarded. Knowing he needed something extra-ordinary to take the win, Wilson put everything on the line, completing an extremely critical Alley Oop aerial maneuver to score the first perfect 10 of this year’s competition. Following up with a 8.93 slob grab reverse aerial maneuver, Wilson cemented his win over the local favourite and was chaired up the beach as the deserved 2013 Mr Price Pro Ballito Champion. Wilson is the second Australian to win the event since Chris Davidson (AUS) in 2008 and has pocketed R407 500 (US$40 000), rocketing to World No. 1 on the ASP World Rankings. Smith had a dream run through to the final with flawless performances and perfect scores as he defeated Aritz Aranburu (EUK) in the Quarterfinals and Stu Kennedy (AUS) in the semi finals. Unfortunately for Smith it was not the dream finish he’d hoped for, nonetheless pocketing R207 500 (US$20 000) and assuming the World No. 2 position. The Australian contingent proved the most dominant on the final day of competition, with Stu Kennedy and Mitch Crews reaching the semi finals and placing equal third respectively. Crews brought his big match temperament to an all-important semi final clash against Wilson. Producing a full repertoire of maneuvers, Crews was unfortunate not to find the near perfect score needed to beat the polished and more experienced Wilson. Crews advanced from World No. 39 to World No. 27. Kennedy suffered a case of nerves against Smith in their semifinal match up. Feeling the pressure against the local favourite, Kennedy went for big turns but was uncharacteristically not able to stick them. The Australian was defeated in a combination situation. Kennedy rockets from World No. 53 to 31 and will be looking to climb the ladder in the hope of qualifying for the WCT in 2014. The Mr Price Pro Ballito enjoyed six days of action packed world-class surfing as Willard’s Beach delivered great waves and capacity crowds. The action continues tonight with the Free Music Concerts on the Beach at Salt Rock and more exciting Festival activities at the Mr Price Pro Ballito Beach Festival tomorrow. Log on to www.mrpriceproballito.com for more information including highlights and results.